PUPILS from Edinburgh’s Broughton Primary School are celebrating after they were revealed as winners of the 2016 Edinburgh Marathon Festival Junior Races competition. Over 800 children from schools across Edinburgh, East Lothian, Midlothian, West Lothian and Fife took part in last May’s event, which was the biggest in event’s history. 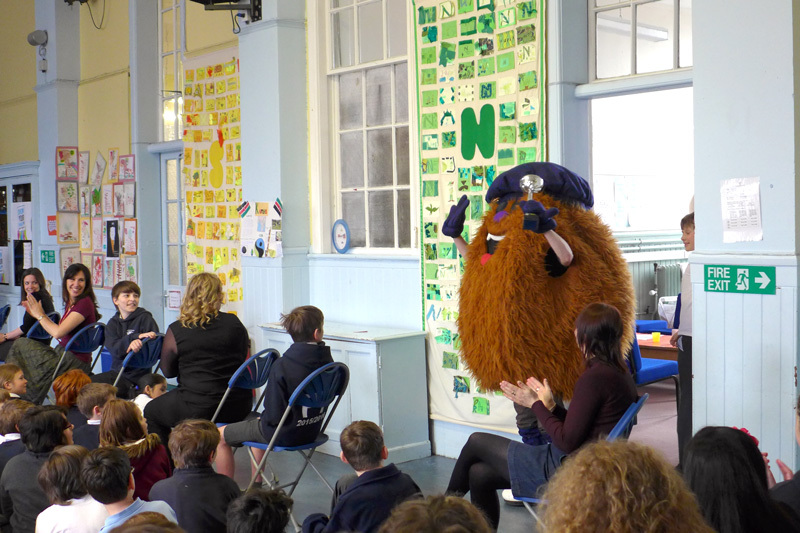 GB London Olympic Athlete Freya Ross and EMF mascot, Mr Hairy Haggis, made a special visit to Broughton Primary’s full school assembly on Monday morning to award the school with their winning trophy and £150 worth of sports equipment vouchers. Broughton Primary School were also awarded with ‘Super Active School’ status in 2016. The ’Super Active Schools’ initiative was launched success of The Daily Mile with the main aim to recognise and reward the increased efforts of getting kids active throughout schools in Edinburgh, The Lothians and Fife. “Pupils and staff from Broughton Primary School are a brilliant example of why we do the junior races at EMF and we are really proud that these races help make real change. Due to the success of the races in recent years, the 2017 Edinburgh Marathon Festival sees the introduction of two new junior races – the junior 5K will be open to kids aged 11-18 and the kids’ kilometre will accommodate ages 3-6. Along with the 1.5k and 2k, this means there will be 4 different junior events taking place throughout the day on Saturday 27th May. EMF junior races are filling up fast and are expected to reach capacity in the next few weeks. Schools are encouraged to enter team of a minimum of three, where sports equipment prizes and a trophy will be awarded to the winning school. For more information and to enter, visit www.edinburghmarathon.com. Please welcome our official 1.5K Junior Race Starter – Ravenn Cook! “My father passed away on 31st May 2014. He originally came from Edinburgh before moving South with work. I remember with fond memories the trips we used to make to Edinburgh to visit his mother (my grandma). 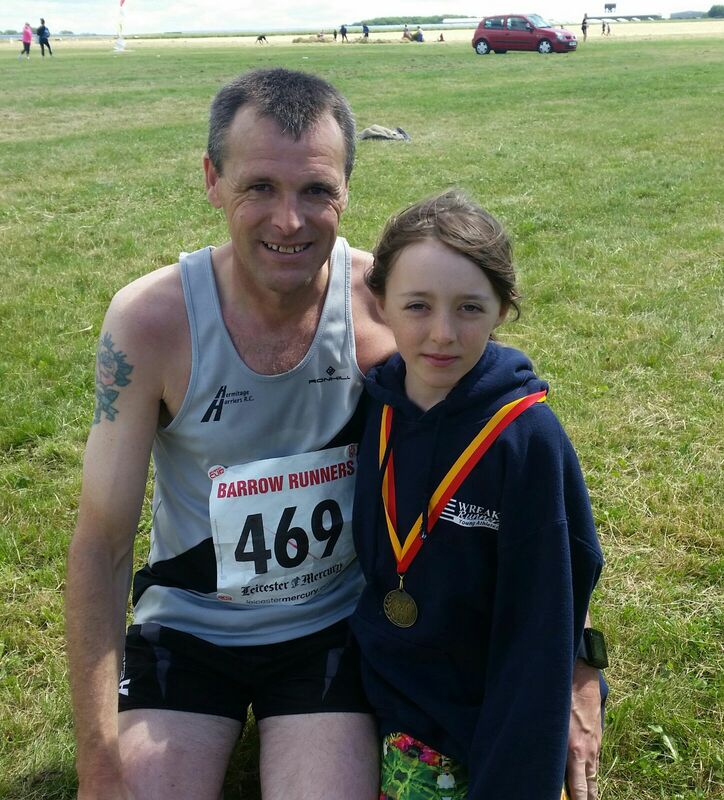 I started running just over 18 months ago, inspired by my 12 year old daughter who has been running since age six. 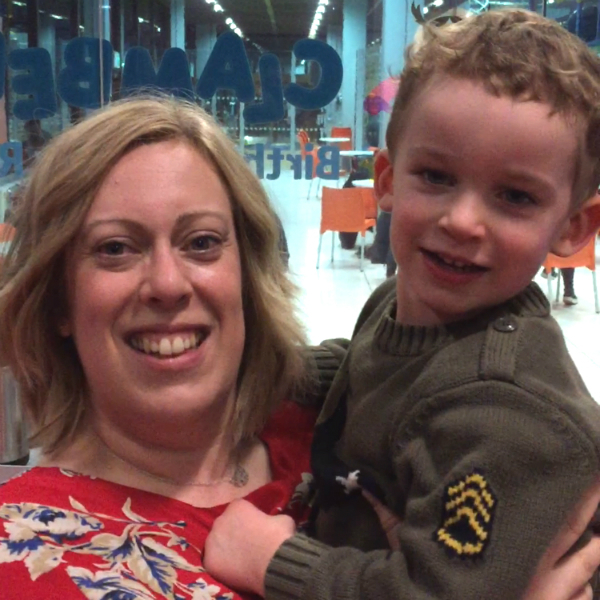 She joined a club aged seven and has been making great progress ever since. We were discussing how we could mark the anniversary of my father passing away and decided that me running the Edinburgh marathon would be very fitting but that it could be quite challenging emotionally. So I entered, my daughter then wanted to run, so has entered the junior race. She was very close to her Grandad and he even gave her a new set of running spikes on the weekend he passed away and although she has outgrown them, she refuses to get rid of them; they hang above her bed as a reminder of him. Massive good luck to all the Family! 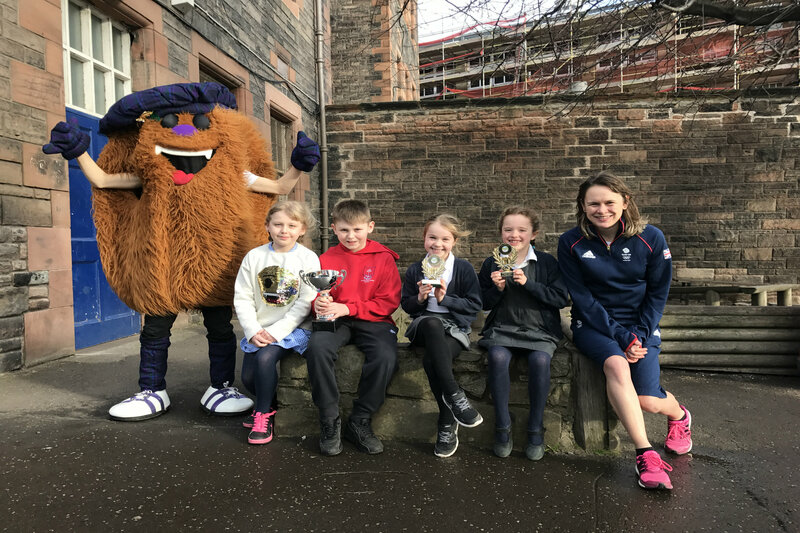 PUPILS from Edinburgh’s Craiglockhart Primary School are celebrating after they were revealed as winners of the Edinburgh Marathon Festival Junior Races competition. Over 750 pupils from schools across Edinburgh, East Lothian, MidLothian, West Lothian and Fife took part in last May’s event, which was the biggest in the event’s history. 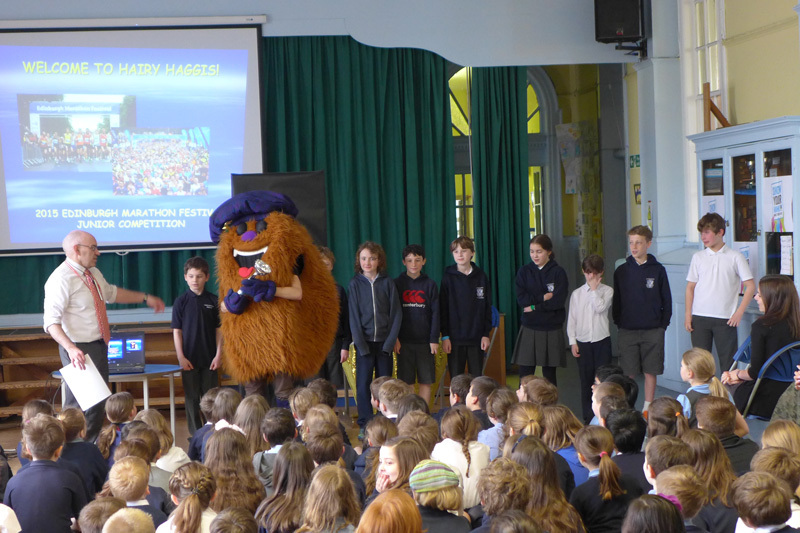 The winning school received a trophy, handed over by the event’s mascot Mr Hairy Haggis (pictured above), as well as a voucher for £150, provided by Eveque Leisure Equipment, towards purchasing athletics equipment for the school. The event, held on 30th-31st May last year included a Marathon, Half Marathon, Team Relay, 10k and 5k events as well as two Junior Races. This year’s races take place in the picturesque surroundings of Holyrood Park and include a 1.5k for 6-8 year olds and a 2k for 9-12 year olds on Saturday 28th May. Each finisher receives a t-shirt, medal and fantastic running experience with chip timing in one of Scotland’s finest city centre venues. Schools are encouraged to enter teams of a minimum of three, where sports equipment prizes are will be awarded to the winning school. 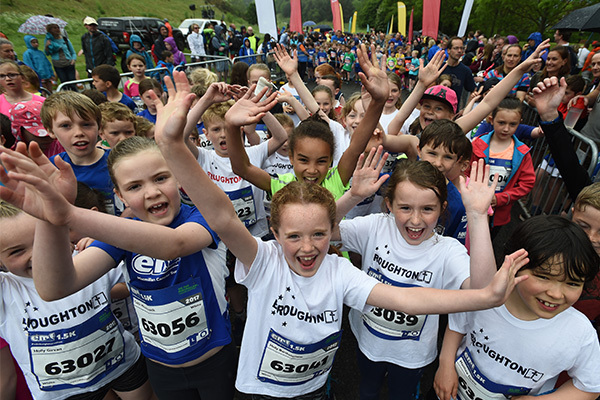 EMF 2016 junior races have now reached capacity, we can’t wait to welcome all the youngsters to Holyrood Park on 28th May! Late entries are still open for the full marathon (charity only), half marathon, 10K, 5K and team relay, until 4th May, enter here.